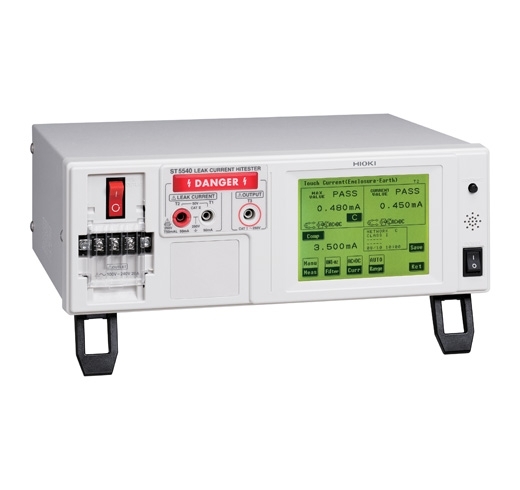 The ST5540 complies with JIS, IEC, and UL standards governing medical- and general-use electrical devices. Uninterrupted polarity switching function dramatically reduces cycle time. Support for rated currents up to 20 A gives the instrument more than adequate capability for testing products designed to comply with new standards. Touch panel features simple, interactive operation. Communications functionality and external I/O support allow automatic testing on production lines. 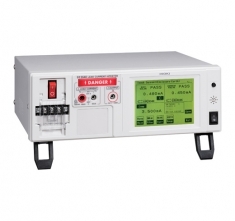 Note: Always use an isolation transformer when measuring leak current for medical-use electrical devices. The ST5540 does not include an isolation transformer. When measuring medical-use electrical devices, use a step-up isolation transformer or similar component operating at 110% of the rated supply voltage as the power supply for the device under test. Measurement unit floats relative to instrument ground. Functionality 110% voltage application, automatic test, data storage for 100 target devices, clock, data backup, printed output (optional), etc.